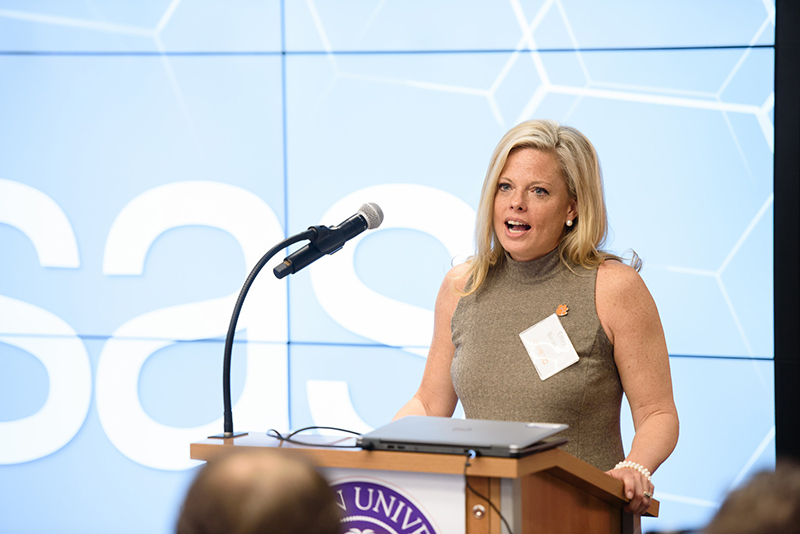 Emily Baranello, vice president for education practice at SAS, spoke during the announcement of the SAS Clemson partnership. Clemson’s research goals and thousands of students and professors have gained a powerful ally — analytics leader SAS. Through a new educational partnership, SAS and Clemson will provide research, software, services and funding to the Watt Family Innovation Center. Thanks to the new partnership, professors, students and researchers can access and apply advanced SAS Analytics, business intelligence, cybersecurity and data management software toward that mission. SAS also provides teaching materials, onsite faculty and staff training and helps develop analytical programs. Professors will be able to easily integrate SAS software into coursework, giving students hands-on experience with this highly marketable skill. In fact, a study of 54 million employee profiles on PayScale.com identified “Knowledge of SAS” as the No. 1 career skill that translates into salary bumps. The Watt Center promotes student engagement, interactive learning and partnership with industry and government. SAS was recognized in March as the sixth Founding Innovation Partner for the Watt Center, joining Comporium Inc., Haworth Inc., Philips Lighting, Scientific Research Corporation and SCRA.